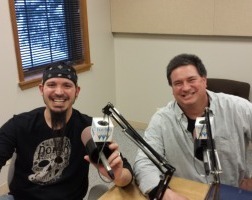 Loud and Proud Hosted by Jeremy Soderstrom and Eric Piwowar., As music enthusiasts, Jeremy and Eric talk about the raw grit of heavy metal, rock, and punk. Their insight and experience with the genre enlightens listeners with a appreciation for all aspects of the metal community. Their focus is to embrace local music, and they do this by inviting local rock bands on the show to share their musical insight. Their blue collar aesthetic correlates with the rawness of metal and rock and will captivate any listener who shares their love of music. Click on the “Shows” button in the right column of this page to view Loud and Proud broadcast schedule. Scroll and Click below on any of Loud and Proud broadcasts that interest you. The following shows have been archived, but selected shows can be made available upon request by contacting Huntley Community Radio at (847)802-4641.